I made a double batch of granola today because we are heading out in the RV soon and my little Advantium oven really can't accommodate large cookie sheets and I don't have the patience or want to spend the time it would take to bake small batches! This is a really tasty recipe and you can adapt it to suit your tastes which is exactly what I did to the original recipe!! Its great with milk, yoghurt, fruit, ice cream, chocolate - use your imagination! Remove from oven and transfer into a larger bowl. Add raisins and mix until evenly distributed. I have made this recipe, and it is fabulous! So easy too, and it makes the whole kitchen smell wonderful! I am not sure if I have seen maple syrup or coconut (I will have to look up the danish words!) here but I will check tonight. Maybe if I can't find it, I will see if Crystal can send me some! Ha! It really is very good, even right out of the bag. 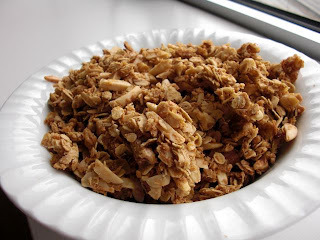 I am going to try to make your Granola this weekend since the batch Crystal made last week is already long gone. Thanks for posting the recipe!